Fuel Resources are the hardest material to collect in the game and certainly something you'll run out of. Here's my experience with some tips for obtaining more Fuel Resources for Mother Base facilities. 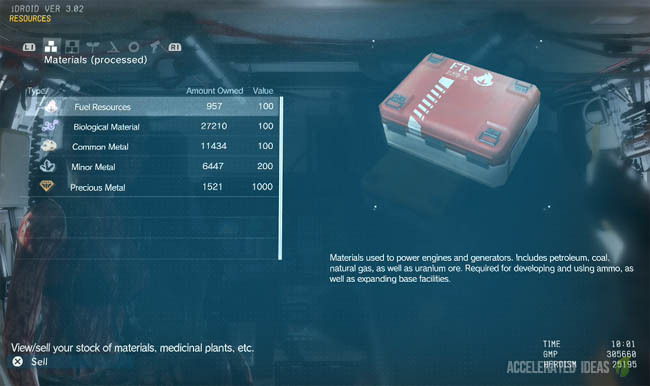 MGS 5 uses several resources for all kinds of building projects including Mother Base expansions, weapon unlocks and some equipment. 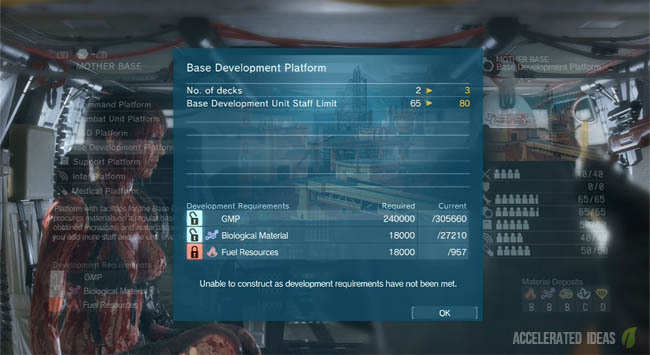 The red coloured Fuel Resources are used extensively to expand platforms at Mother Base so you can recruit more staff and achieve higher Unit levels. This is especially true for the third platform upgrade which requires 18,000 Fuel Resources to start construction. 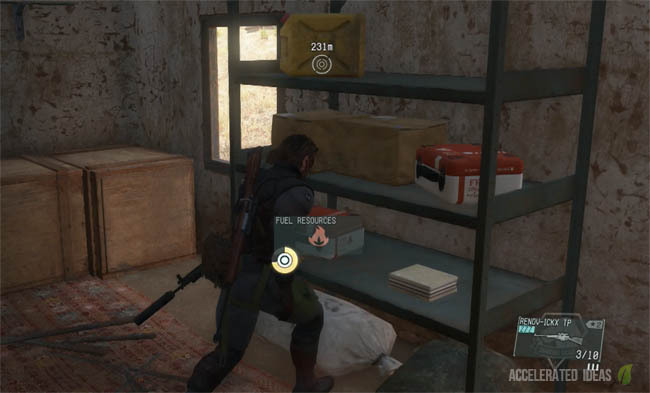 Resources are progressed slowly in MGS 5 and I haven't found any quick wins to obtain tonnes of the stuff quickly. Instead there's a couple of ways to guarantee a regular income. You should have stumbled across a few of these while out on missions. They're the little container/box items that are coloured to relate to a particular resource in the game. See the image above. The red items are for Fuel Resources and collecting them rewards you with 100 a piece. As you can imagine this is fine for the lower levels but it's not much use once you reach your 2nd and 3rd platform expansion. In any case,it's good practice to search tents and buildings for resources on your journey. This Unit is the key to acquiring resources automatically over a longer period. Every time you finish a main mission or side op, resources are added to your tally depending on the level of the Base Development team. Those guys convert your stash of unprocessed materials into usable resources. The higher the rank of this unit the more they convert unprocessed into usable resources. Levelling up this platform follows the same principle as other teams at Mother Base and you should use similar tactics here. While out in the field look for soldiers with skills in Base Development and make sure you Fulton them back to base. Elite soldiers will come in handy but also make sure you gain numbers over quality in the early missions. These are the guys with an A rating or higher. When it comes to expansion of the Mother Base facilities you can either choose to develop Command Centre which evenly distributes more space for each of the teams, or expand Base Development itself to provide more room just for that team. If you do run out of space then new recruits are placed in the waiting room, meaning that they won't contribute to any teams overall ranking - including the Base Development platform. Side Ops are much quicker than main missions, offering you the opportunity to free roam while resource gathering takes place at Mother Base. Every time you complete a Side Op and return to the chopper, there will be more raw resources at your disposal. Complete several Side Ops and your tally will have increased nicely in the background. Side Ops are also an easy way to Fulton staff back to base. These missions give you more time to locate and capture soldiers with better skills, without the hassle of Boss fights and other longer checkpoints. These missions are a stress free way to earn GMP, materials and in some cases new recruits automatically. Your combat Unit takes control of these tactical missions in the background and Big Boss isn't required to take part. The default settings allow you to send out two groups of soldiers to take on two separate missions, with the potential to earn resources for you automatically. The chance of success depends on the strength (ranking) of staff in the Combat Unit and the chance of rewards varies by mission. Keep you eyes on the Dispatch Missions list (which was unlocked following mission 10 for me) and make sure you've always got two missions on the go at any time. Also make sure you select missions with the chance of material rewards. 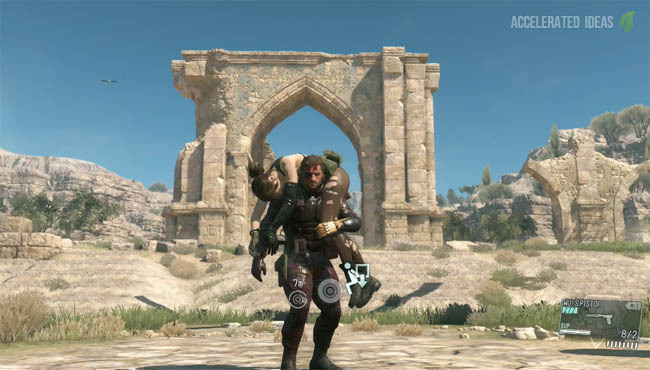 There's one final solution to the shortage of materials in MGS 5 and that's FOB's. Known as Forward Operating Bases, these platforms are expansions to Mother Base, just like your other facility expansions with one major difference. This difference comes in the form of a risk of attack and potentially it's highly annoying, this is why I've left this option for last. In order to build FOB's you need to go online and by doing so you open your base up to other online players to attack. They can steal your recruits and resources. FOB's aren't available until Base Development reaches a certain level (level 24 i think) so you should have a decent arsenal by then, but so will other players. 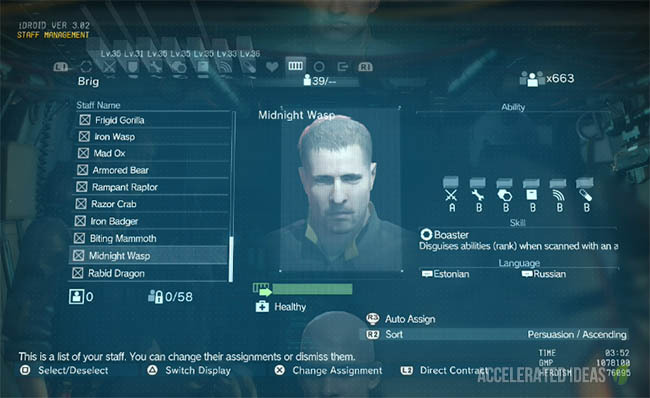 If you've got a strong defence and understand how to navigate Mother Base quickly then this option might not be a problem for you. However, the biggest issue with FOB's is they seriously interrupt gameplay. If you're in the middle of a mission and someone attacks your base then you'll receive a warning message. If you choose to respond you loose all progress in that mission and even ignoring it is worse because you could loose recruits and GMP. For me this is highly annoying and I prefer to farm for resources offline, until at least all the main missions are complete.